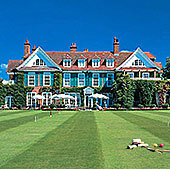 Perched on the edge of the New Forest, Chewton Glen is more than a hotel, it is a destination in itself. You may go for the food under the capable hands of Michelin starred Chef Luke Mathews, de-stress in the comfortable rooms and suites that offer ambience from comfy old world country to modern hi-tech loafing around in bed or reading. You may even want to relax to the extreme with massages, hot tubs, and other body/mind soothing techniques of the world class Spa. OR you may prefer to be very active and take in a round of golf, bike the country lanes, play a dignified round of croquet, smash a tennis ball inside during nasty weather or outside during fine. The byways of the New Forest with its moors and forest, its untamed ponies and the coastal villages and inlets that can extend miles into the landscape all offer interest both natural and man made. We arrived during the Christmas season. It was a time of crisp, damp days sometimes sunny, sometimes grey and misty. It was often wet. The drive through the New Forest was lovely but dripping. Our hearts went out to the shaggy haired ponies who looked miserable even though the grass was lush and green. But the woods take on a special, magical quality in the mist and drizzle with the trees still wearing some of their curled and brown leaves. The spongy forest floor a pale brown of leaf mold. While winter is often not the favored time to travel, it has it's own joys and the warmth and welcome of this hotel makes the most of it. Just because it is rainy outside does not mean everything stops. Play tennis inside in the warm. 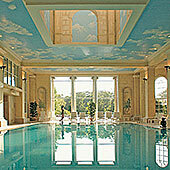 Swim in the large pool with a Roman ambience. Luxuriate and be pampered in the Spa. Read and have tea in the library in front of a blazing fire or just enjoy the comforts of the rooms and suites punctuating the day with the really fine food found here. Of course the spring and summer are glorious and the rest of the outdoor activities expand. But this is a year-round destination which allows the foreign traveler to take advantage fewer crowds and more relaxing and cheaper travel. Chef Luke Mathews has been recognized internationally by the Michelin Guide who have awarded him a star as well as other food guides and travel writers. His style of cuisine is eclectic. He makes extensive use of only the freshest local produce such as wild mushrooms, vegetables and game from the New Forest (but no roast of pony so relax), with fish and other sea food fresh from the local fishing villages of Christcurch and Lymington (also destinations to explore and enjoy). Today, the menu is partly classics from the culinary history of Chewton Glen as well as modern renditions - something to suit everyone's tastes. 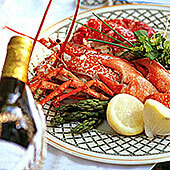 The fresh salt sea air off the English Channel will certainly stimulate your appetite for seafood with the beach only a hop, skip and a jump from the hotel. The wine selection is extensive. It was voted "In the Top 10 of UK Hotel Spa's" at the Conde Nast Traveller Magazine Reader Spa Awards 2014. Many will enjoy the pampering of the recently made over Spa at Chewton Glen Recently voted Best Hotel Spa in Europe by Germany's "Gala" magazine, Chewton Glen's spa is a place to stimulate health, fitness and relaxation. A selection of over 50 beauty and body treatments is provided by highly qualified therapists and fitness instructors. (drop the front "0" when calling from abroad).